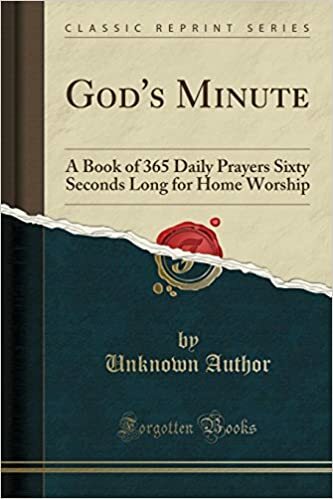 God's Minute is a collection of daily written prayers for Christian worship, primarily at home but also anywhere your daily travels take you. The intent is to enable the reader to establish a practice of taking a short moment to reflect. The prayer for each day is designed to make a daily practice of worship practical and informative. This work is non-denominational and can be utilised by members of all types of Christian church and those of no specific sect or group. The quality and variety of contributors represent a broad range of opinions. Each minister has focused on a new theological area, such as charity, worldliness, patience or adversity. This work is deeply considered and the approach of the authors has been philosophical but fervent. The composition of the work sweeps through the most theologically and emotionally central aspects of Christian prayer without ever lingering too long on one theme. This book will be of particular use to those who feel the burden of finding the right words or appeals to use in prayer as it frees the supplicant from the need to ponder the most appropriate subject for prayer alone. The biblical role of prayer is not to make the correct entreaties or to express gratitude in any specific way, the omniscient creator would have no need of the correct words to hear a prayer but the human mind can be directed, broadened and challenged by words spoken or read. The genius of the book is that it takes the reader where they need to go, without ever asking them for direction.